The Art of Captioning – The Captioning Group Inc.
As in art, realtime captioning can be defined as the skillful application of correct knowledge to the order of making. For us, the journey for knowledge begins prior to each and every show that we cover. Quality captioning does not just happen; it is an art form that takes years and years of training, coupled with continued learning, to produce captions that are worthy of public display. So how do we deliver these captions to your TV? The process is rather involved, yet simple. We begin by researching the show topics and content, hosts, and guests to make sure that our captioners are prepared for anything that might be discussed during a given show. After our research has been concluded, the captioner then enters any missing information into their steno dictionaries and prepares to go to air! To view the show that we are covering, we receive a satellite or local cable feed of the program, and we always use a studio audio feed as well. The captioner then listens to the program as it is being aired and simultaneously writes the spoken word on a steno machine at speeds upwards of 250 words per minute at an accuracy level of 99% or higher. In order to transmit the data to the broadcast studio location, we have to first convert the steno to comprehensible text. The steno machine is connected to a computer that takes each steno stroke and translates it by the captioner’s user-defined dictionary (just like a French-to-English dictionary), and the translated word is then sent to the modem. The modem is connected to an encoder at the broadcast location, where it is encoded and entered into line 21 on your TV at home in a matter of seconds. The encoder can be either a dial-up or an IP encoder. The art of a closed captioner’s job is to understand, process, translate, and punctuate the spoken word, all while keeping up with lightning-fast speakers in order to ensure that the closed captioning that reaches your TV is accurate and comprehensible. 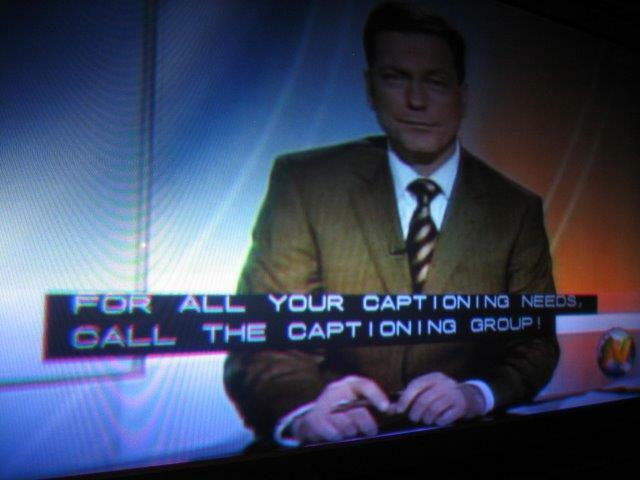 Virtually every television on the market today is equipped with closed captioning capabilities. It is as simple as pressing a button or changing the settings on your TV to receive a captioning feed. The entire process takes only two to three seconds to reach your screen at home.